Anywho – today’s entry is something I put together to help remember the day we celebrated my sister’s birthday. It was a small but delightful surprise party that was held at a local family restaurant. What’s there not to love about a surprise party? Food, family and love was plentiful and my sister certainly seemed to enjoy the event. As I look at this entry, I adore being able to capture events in my journal. It’s a lovely way to remember the events of the past year and gives me an excuse to create something creative and special to share. In the spirit of sharing, I thought I would start giving a brief overview on my process of creating each journal entry and the materials I use. I am not one to keep ideas secret, so If you are ever curious about a particular technique or material I used, please feel free to comment and ask. 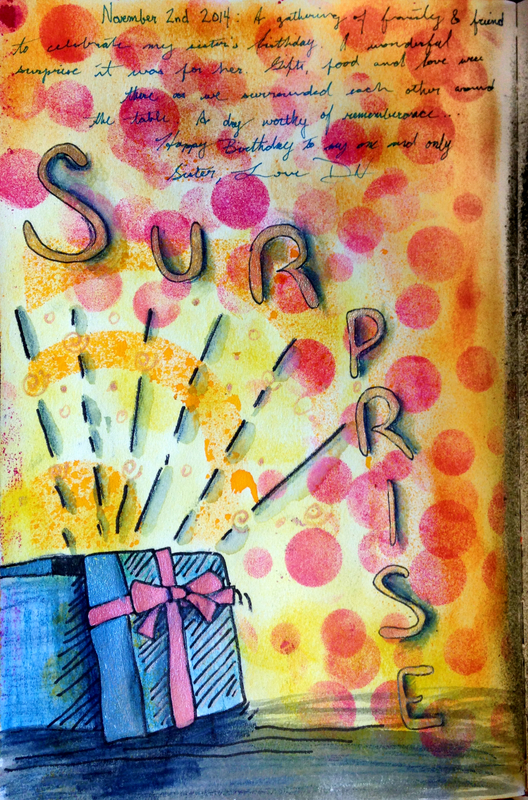 The process: This journal page began with a simple sketch of an opened present and the words ‘surprise’ drawn lightly in pencil. Using mini Distress inks, I began applying color using a circular blender in the background starting with light yellows and then moving to robust oranges. I used a stencil to create the sun light rays coming out of the box and used paint dabbers to stamp the pink, red and orange dots. I then outlined the present and words with my Sakura Pigma pen. The present was colored using Derwent Inktense pencils, and Sakura Gelly Roll Pens. As a final touch I used a Sakura Pigma pen to scribble my thoughts about the day’s events.